Greater Brandon Meals on Wheels provides nourishing mid-day meals from Monday through Friday to those in the Brandon Community who are unable to serve themselves. Volunteers reach out to help home bound neighbors in need of a nutritious meal through the combined efforts of our local Brandon churches. 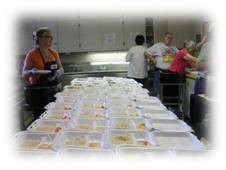 Greater Brandon Meals on Wheels coordinates the activities of the member churches. The menu, preparation and delivery of these meals is the responsibility of each of the member churches. Clients are referred through various organizations, churches, family, physicians, neighbors or friends. Greater Brandon Area Meals on Wheels is a non-profit corporation organized under the laws of the State of Florida, Incorporated under Section 617.1622 of the Florida Code.